People have designed labyrinths for thousands of years, and they are making a comeback in Washington D.C. and Maryland homes as a stunning garden trend. These mazes and their distinctive patterns have served as both meditation devices and unique landscaping features. Labyrinths are a fascinating idea that can let you wow your neighbors with your yard. 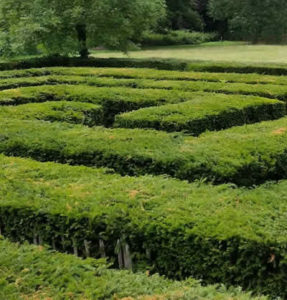 David Tolzmann says that his Connecticut-based Labyrinth Company has seen “steady growth” in the number of private labyrinths being constructed. The paved portions provide “self-serve meditation space” for adults and “something cool” for children to play in, he tells the Washington Post. Lauren Artress, who founded the organization Veriditas, which emphasizes the experience of labyrinths, suggests that demand for the structures will increase as people seek out a way to escape technology and achieve peace of mind. Lori Kidder had a seven-circuit, 30-by-60-foot labyrinth built in the garden of her Herndon, Va., home. The rocks used to create the labyrinth came from Kidder’s yard; stones with special meaning stand at the center. Liz Tuckermanty and Dale Manty, built a 60-foot labyrinth on their two-acre home in Cheverly, Md. The labyrinth features pathways lined with liriope, and three benches and a trellis in the center. An upcoming documentary, “Labyrinth Journeys,” will feature several labyrinths in the Washington, D.C., area. The film will be screened May 31 at Washington National Cathedral. The Labyrinth Society website lists different types and styles of labyrinths, as well as tips for building your own. There is a wide range of design options, including a “classical” style based on ancient Greek patterns and modern geometric designs. You can also use the World-Wide Labyrinth Locator to find existing labyrinths that might inspire your home version. There is truly no “wrong” way to design a labyrinth, making it an ideal way to add unique style to a property. Contact us if you are ready to achieve the home and garden of your dreams!